3x your impact! Amazon is tripling the donation rate on your first smile.amazon.com purchase – through March 31! Go to smile.amazon.com/ch/46-0557908 and Amazon donates to Mystery Dog Rescue. Support us when you shop on Black Friday. Go to smile.amazon.com/ch/46-0557908 and Amazon donates to Mystery Dog Rescue. HO HO HO! Santa is coming to town and wants to know if your fur babies are on the naughty list or the nice list. 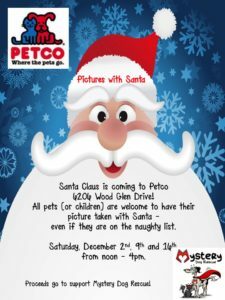 Regardless of what list your babies are on, bring them by the PetCo at 6206 Wood Glen on December 2nd, 9th and 16th to come get their picture taken with the big man himself. All Proceeds go to help Mystery Dog Rescue. You get 25% OFF at 1-800-PetMeds, and we get a $20 Donation! Shop Now!